Today's card was super quick and easy to whip up using two of Graciellie Design's recent releases. 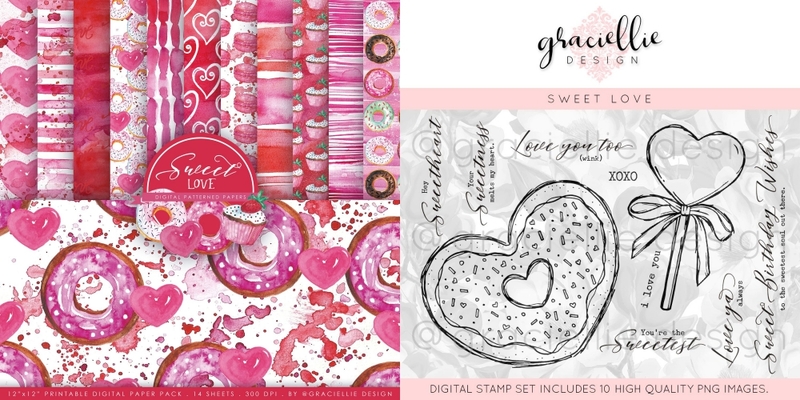 I used the Sweet Love Digital Paper Pack along with it's coordinating Sweet Love Digital Stamp Set. The only other supplies I used on this card were Prismacolor Pencils, a few sequins, a bit of clear glitter, and a few splashes of acrylic paint. I almost felt "guilty" when I finished this card because making something this bright and happy shouldn't be so quick and easy - but it is when you use digital papers! 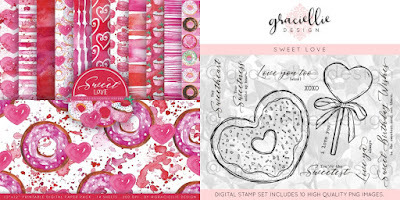 Love your cupcake and what fabulous papers.